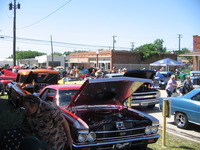 This is some pics of today's car show. 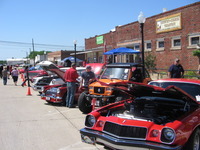 A small gathering of some 40-45 cars in Farris TX. Ate some good BBQ and had a great time with some friends. 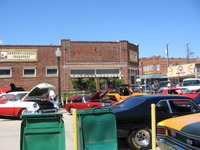 That's my old buddy's wives store I'm parked in front of. I had a lot of RZR guys come over and quiz the thunder out of me how I got mine street legal and what they can do to get theirs that way. HA! Looks like a good day. I just hope to see 60 plus degree days again. Almost 90 here today and tomorrow. I've got a Rock Creek BBQ meet tomorrow for lunch and its getting hot already. Supposed to hot tomorrow and then drop back to the 70" for the high all next week. This is our best weather all year as far as I'm concerned. We are suppose to see 59 today. Yippie.